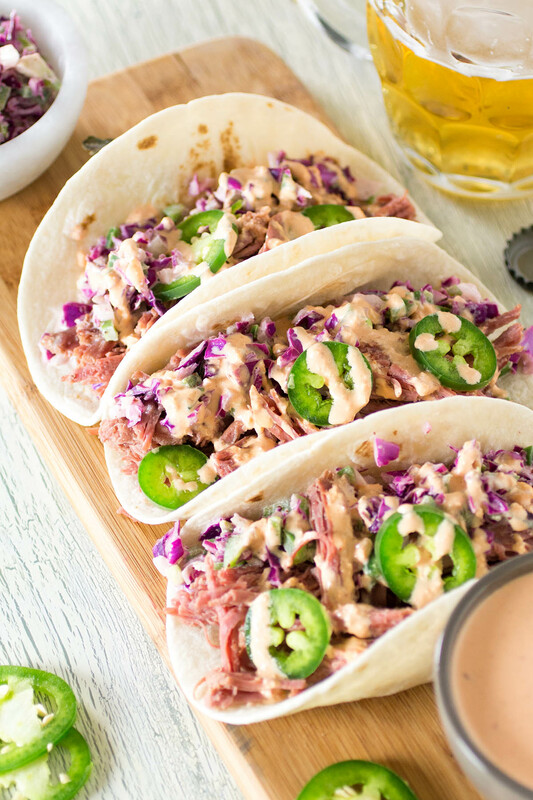 Celebrate the Irish way with this recipe for shredded corned beef served on warmed flour tortillas, topped with a creamy cabbage-jalapeno slaw and homemade thousand island dressing. Oh yes, we’re going there. 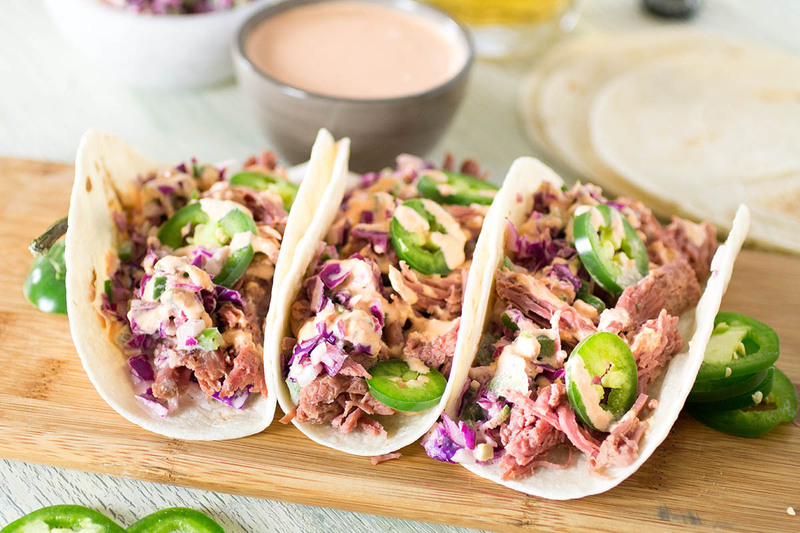 CORNED BEEF TACOS. I am part Irish, so I’m allowed to experiment with my traditional corned beef, but you know, aren’t we ALL a touch of Irish this time of year? So I am giving you permission to skip your typical corned beef with potatoes this year and try something completely new and fun. Yes! CORNED BEEF TACOS! I can’t say it enough. These are super delicious and they put a tasty new spin on tradition. 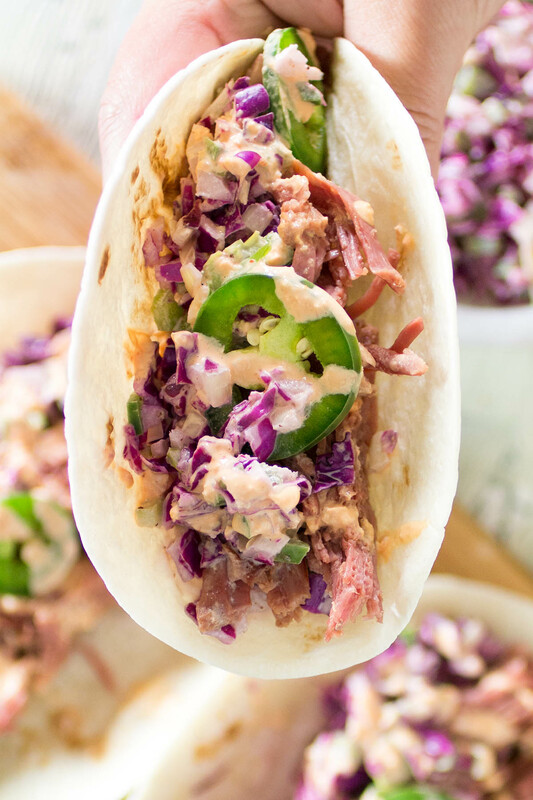 What we have here is slow cooked corned beef served on warmed flour tortillas with a creamy slaw made from shredded cabbage, onions and jalapeno peppers, then drizzled with a homemade thousand island dressing. For this recipe, cook the corned beef your traditional way, according to the instructions on the packaging. I kept it simple and added it to a Dutch oven with an inch of water and the provided seasoning packet, along with a few other seasonings for extra flavor. I’d like to complain about something, though. Why, oh why, is it so difficult to find corned beef the rest of the year? The stuff is AWESOME! I would absolutely cook corned beef all year long if I could find it. Alas, we’re stuck waiting around for St. Patrick’s Day, so I will enjoy it while it is here. I actually bought 2 of them and am keeping one in the freezer for later. Cook the corned beef at 350 degrees F for about 2-3 hours or so, or until it is fork tender and shreds easily. The slaw is easy to make and you can whip it together while your corned beef is baking. To make it, shred a cup worth of purple cabbage and combine it in a bowl with a small diced onion and a diced jalapeno pepper. Toss it together with mayo, mustard and apple cider vinegar. And please, do not forget the Homemade Thousand Island Dressing Recipe. Of course you can save time and grab some from the store, so feel free to use your own preferred brand, but I have to say that the homemade version is crazy good and better than anything you will get from the store. All the recipes are included below for you, along with a link to the Homemade Thousand Island Dressing Recipe. I hope you enjoy the meal. Let me know if you make this and how it turned out! Have a great St. Patty’s Day! This is absolutely NOT your typical corned beef and cabbage. I would not normally order corned beef and cabbage in a restaurant, but this is DELICIOUS. It uses all the same components, but it’s so different. I love it. Add the corned beef to a large pot or Dutch oven along with the spice packet contents, mustard powder, cayenne pepper, garlic and seasonings. Add about an inch of water and cover. Bake for 2 hours at 350 degrees, or until the corned beef is nice and tender. Uncover and increase the temperature to 400 degrees and bake another 15 minutes. Remove the pot and cool slightly. Shred the corned beef with a fork and set aside. 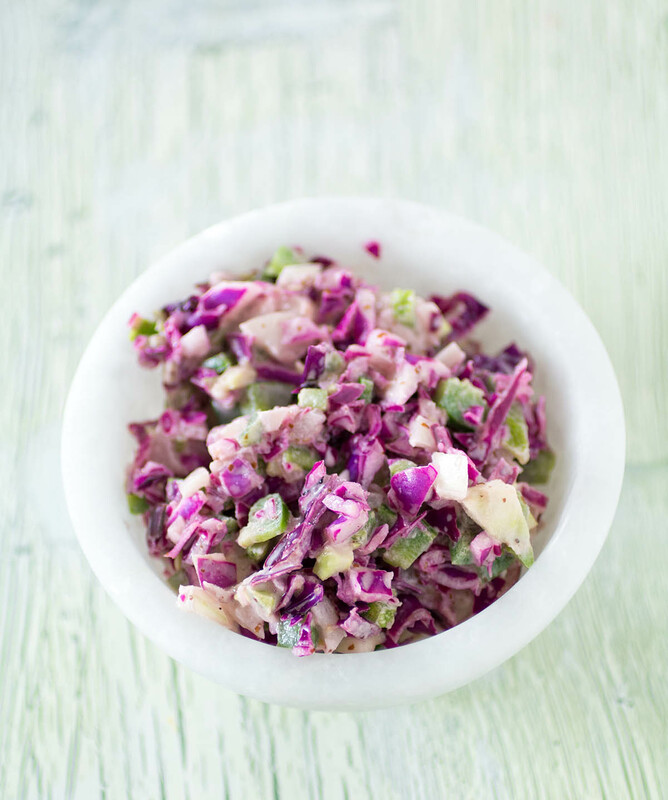 For the slaw, add all of the ingredients to a bowl and mix well until nice and creamy. 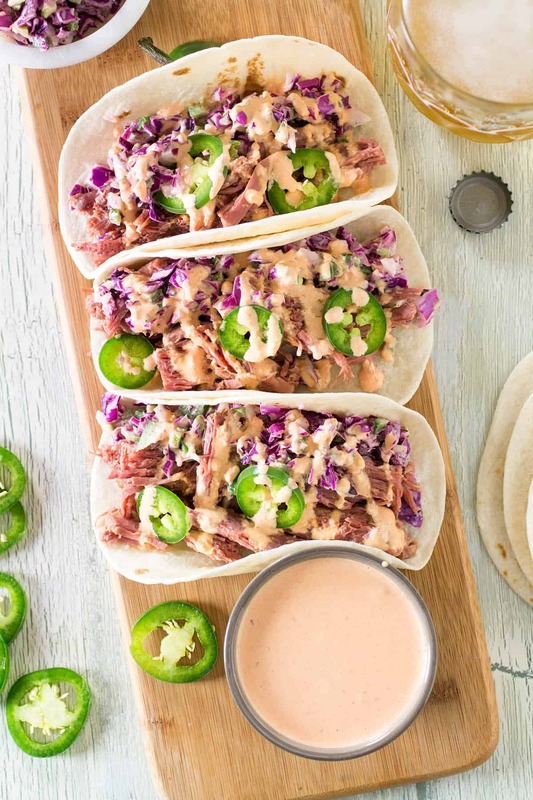 Serve the corned beef on your warmed flour tortillas, then top with the creamy cabbage slaw and drizzle with homemade thousand island dressing. Enjoy! Makes 10-15 tacos, depending on how much meat you like to include with each taco. I like to use only half the corned beef brisket and save the other half for another recipe. Try our Homemade Thousand Island Dressing Recipe for serving. What is the “spice packet” that’s mentioned? Amber, often a corned beef brisket comes with an included spice packet. I’ve tried it several times and it’s great in the crock pot. Is this real life? An IRISH TACO!? Seriously, it doesn’t get any better than this. I. AM. OBSESSED.